Celtic bracelet is a rhodium plated design with Trinity knots that are enhanced with a crystal surrounded green glass stone. This rhodium plated Celtic link bracelet has a green glass stone that rests between two crystal accented Trinity knots. The Celtic bracelet measures 3/4“ tall and 7 1/2” long, including the hasp style clasp. 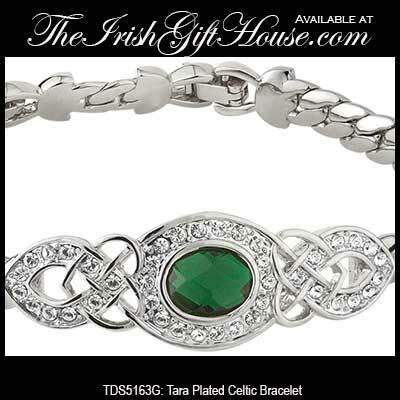 The Trinity bracelet is crafted by Tara Jewelry in Dublin, Ireland and it is gift boxed with a Celtic knot history card, complements of The Irish Gift House. Celtic bracelet is a rhodium plated design with Trinity knots that are enhanced with a crystal surrounded blue glass stone. Celtic bracelet is a hinged bangle that is plated in rhodium and is accented with crystals.